Although the $10 “eagle” was the largest gold coin issued under the Mint Act of 1792, it would be over forty years before most citizens would see this “Flagship” denomination. First minted in 1795, Congress’ ill-conceived 15 to 1 silver/gold ratio doomed the coinsand their smaller brothersto hoarding and melting from the start. The result was inevitable. Eagle production ended in 1804, quarter eagle mintages remained minute, and only half eagles were made in quantity, primarily for transactions between banks. Many still succumbed to European melting. Finally, in an effort to return gold coins to the channels of commerce, Congress passed the Act of 1834, changing the silver/gold ratio to 16 to 1. Almost overnight, U.S. silver coins were worth more than the equivalent amount in gold coins. At that point gold coins reentered circulation in abundance. The favorable price the U.S. paid for goldvis-a-vis silver guaranteed the Mint a continuous supply of the yellow metal that would last for years. The California Gold Rush only fueled more production, and made gold coins familiar across the land. But the Civil War would change all that, as it would change everything in America, including the coins themselves. At the beginning of the war, hoarders and speculators saw to it that gold coins again vanished from public view, including the eagle, reintroduced in 1838 after a 34-year hiatus. As battles raged, and one side or the other proved victorious, confidence in paper currency quickly faded. Soon the gold eagle was worth 20 percent or more over face value in Federal “greenbacks.” As the war progressed with casualty rates of more than 80 percent and the decimation of entire regiments the nation as a whole experienced a spiritual revival. The somber and reflective mood of America was as deep as the scars of the war, and it seeped into every facet of daily life. In 1861, in a letter to Treasury Secretary Salmon P. Chase, the Rev. M.R. Watkinson of Ridleyville, Pa. proposed recognizing the nation’s faith in the Deity on the coinage. A religious man, Chase embraced the idea and directed Mint officials to proceed with designs. Patterns of several denominations struck between 1861 and 1865 experimented with various mottoes, such as “God and Our Country” or “God Our Trust.” The final selection was IN GOD WE TRUST, familiar on our coins to this day. The new two-cent piece received the motto in 1864, and the Coinage Act of March 3, 1865 ordered its placement on gold and silver coins as well. It would first appear on the eagle in 1866. The eagle issued since 1838 was the Christian Gobrecht designed Coronet/Liberty Head, featuring a neoclassic head of Liberty adorned with a coronet inscribed LIBERTY. Thirteen stars surround the bust, with the date below. The reverse depicts an eagle holding arrows and an olive branch, encircled by the inscriptions UNITED STATES OF AMERICA and TEN D. Chief Engraver James Barton Longacre placed the new motto on a scroll over the eagle’s head. From 1866 through 1869, only Philadelphia (no mintmark) and the increasingly important San Francisco (S) branch struck this new design. Production began at Carson City, Nevada (CC), in 1870 and continued through 1893. New Orleans (O) coins appeared in 1879, and the new Denver (D) facility began mintage in 1906. Mintmarks are found on the reverse, below the eagle. The first twelve years saw especially low mintages and many later dates never exceeded 100,000. Over the entire life of the series, only 37 dates show six-digit production, and just 10 dates saw more than one million struck. There are five issues with mintages below 1,000: Philadelphia coins of 1873, 1875, 1876 and 1877, and the New Orleans issue of 1883. Proof eagles were struck in Philadelphia every year of the design. If business strike mintages were generally small, proof production was virtually microscopic, totaling just 2,327 coins. From 1866 through 1907, only in 1900, 1902 and 1904 did proof coinage exceed 100 pieces. In considering the rarity of Liberty Head eagles with motto, it’s apparent that limited mintages went hand in hand with collector disinterest in pieces of such high face value. Relatively few coins were struck, but there were even fewer collectors interested in gold coins by date. Nor is low mintage the only guide to rarity. Some dates with relatively high figures are substantially scarcer today than their published totals might suggest. 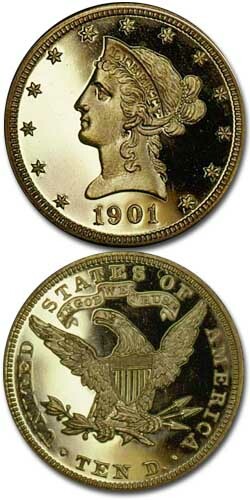 The 1888 Eagle is a case in point. Though 132,973 business strikes were produced, the coin is elusive in any grade and virtually unknown in mint state. With the exception of 1901-S, and to a lesser extent, the 1901, all issues of this series are RARE in gem uncirculated, limiting type collectors to only the occasional appearance of other dates. Infrequently, one-of-a-kind superb pieces surface in “name” collections, like the amazing 1899-O or 1901-O (among many others) from the Eliasberg estate. If few collectors sought uncirculated eagles by date, the number seeking proof gold was vastly smaller, with even the great 19th century collectors showing only casual interest in these costly coins. The remarkable Garrett family collection was one of the few to boast a nearly complete run of gold proofs of this era. The family’s vast wealth enabled at least two generations of Garretts to routinely order complete sets of all proof gold denominations each year. Even so, one has a distinct feeling that the Garrett holdings were assembled as a kind of automatic reflex action rather than a consciously savored decision made each year. The series contains enough major rarities to have attracted the attention of coin alterers. Since several of the most elusive issues were struck in Philadelphia, mint mark removal has been attempted to simulate Philadelphia strikes of 1873, 1875, 1876 and 1877. Counterfeits also exist of other dates, many made in the Middle East. Authentication of questionable specimens is highly recommended. When grading this design, look for traces of wear on the top of the coronet over Liberty’s forehead, on the top of her hair and just over her eye. On the reverse, check the tips of the eagle’s wings, neck and claws. While describing the degree of wear is straightforward enough, severe bag-marking and abrasion are major problems on many of these large and heavy coins. Often, deep mint-frost remains, painfully highlighted by a forest of contact tics, reeding marks and scuffing. In 1907, the Coronet Head design was replaced by the Teddy Roosevelt inspired and Augustus Saint Gaudens created Indian Head motif. It would be minted until the end of U.S. gold coinage in 1933.